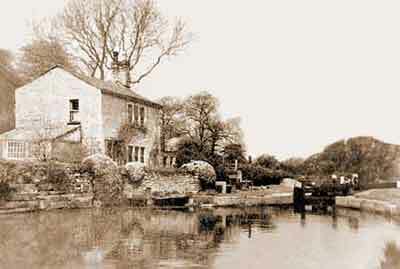 Lock 6 with the lock house on the left, early 20th century. Known as Glen Cottage, it is understood that this lock house was built in 1835. It was demolished in 1962. The 1850 Tithe Schedule describes it as a 'Building and Garden', but two buildings are shown on the Tithe Map. At this time, the Owner of the land on which the house stood (Plot 176) was the Peak Forest Canal Company while the Occupier was the Manchester, Sheffield and Lincolnshire Railway Company. Brabyns Change Bridge with lock 9 on the far side of the bridge, 1906. A lock house stands to the right of the lock and the building beyond it is a stable block. Samuel Oldknow's warehouse is on the left and boats could load and unload here under cover. The entrance lodge to Brabyns Park is just visible on the left. It is understood that the lock house was built in 1834. The 1850 Tithe Schedule describes the lock house as a 'House and Yard'. At this time, the owner of the land on which the house stood (Plot 247) was the Peak Forest Canal Company while the occupier was the Manchester, Sheffield and Lincolnshire Railway Company. Brabyns Change Bridge stands at the top of Brabyns Brow, where the name changes to Station Road, and the name is derived from the country estate of Dr Henry Brabbins, which adjoins the canal and is now known as Brabyns Park. The estate was founded in 1745 and Dr Brabbins was a surgeon in Stockport. Parish records show that a Henry Brabbins was buried in the ecclesiastical parish of Prestbury, Cheshire, on the 18 August 1750. Prestbury parish was large rural parish at this time. The 1850 Tithe Schedule shows that by this time Brabbins Hall and surrounding estate was owned and occupied by John Wright. Samuel Oldknow’s Warehouse looking south, 26 February 2006. This three-storey stone warehouse with an attic was built in the early 19th century and it stands on the offside of the canal on St Martin’s Road between locks 9 and 10. The warehouse is seven bays long by three bays wide with a graduated stone-slate roof and a chimney at each end. The central bay on each side has a loading bay with jib, for loading and unloading, and a canopy above. The northern gable end has a shipping hole, where boats were loaded and unloaded under cover, and an adjacent entrance for road traffic. There is a blind central window at first floor level and a blind window at attic level. The southern gable end has a central door on the first floor and a blind window at attic level. The entrances have semi-circular heads with a single ring of stone voussoirs. The window openings have semi-circular heads with a single ring of stone voussoirs and stone sills. Samuel Oldknow’s Warehouse is Grade II listed, List Entry No. 1242465, date first listed 20 Dec 1967. 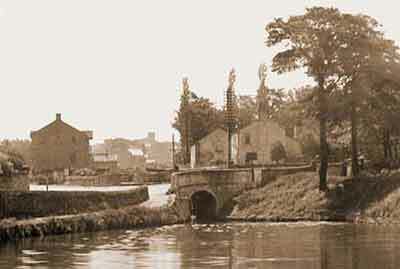 Lock 12 by Black Wharf with Smithy Cottage in the centre background, c.1852. The small building in the foreground is a blacksmith's shop (forge) and the terraced houses in the background on the right are on Brick Row (Long Row). 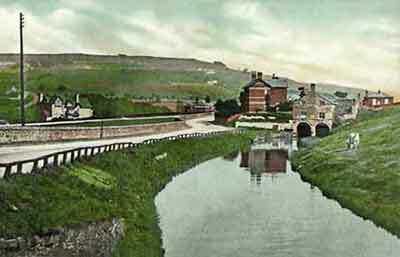 This is the earliest known photograph of the Peak Forest Canal and it first appeared in Strines and its Neighbourhood, No. 6. It is understood that Smithy Cottage was built in 1834. The 1850 Tithe Schedule describes it as 'Buildings and Wharf'. The Owner of the land on which the house stood (Plot 238) was Peter Arkwright, grandson of Sir Richard Arkwright, while the Occupier was Mary Ann Bowden. There has been a long-standing conviction that this building was used as a lock house but the information given on the Tithe Schedule suggests that this may not have been the case in 1850. Whether it subsequently became a lock house is unknown. 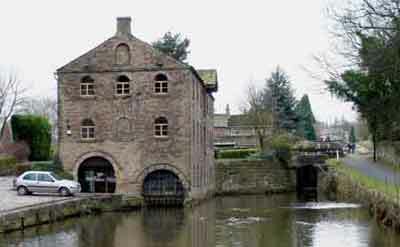 The adjoining blacksmith's shop stood Black Wharf (Plot 237) and Owner was the Peak Forest Canal Company while the Occupier was the Manchester, Sheffield and Lincolnshire Railway Company. It is estimated that this building was demolished in the early 1960s. On Saturday, 16 September 1967, a group of over 50 volunteers from the Peak Forest Canal Society and the London and Home Counties Branch of the Inland Waterways Association gathered at lock 12 to clear the chamber. Items recovered from the chamber during clearance included: Bellows (bearing the Coat of Arms of the Sheffield manufacturer), an anvil, an iron tank and a range of blacksmith's tools. Additionally, there were items of lock-operating gear including several racks and other paddle gear parts. This important group of artefacts associated with the Peak Forest Canal was immediately removed from the site and dispersed. Their whereabouts are unknown. Posset Bridge viewed from Black Wharf pound, c.1920. This view shows the bridge before the road was widened. Lock 13 is ahead of the central bridge hole and the one on the left accessed the Lower Private Branch to Marple lime kilns. The small opening on the right is a horse-transfer tunnel used by horses hauling boats. 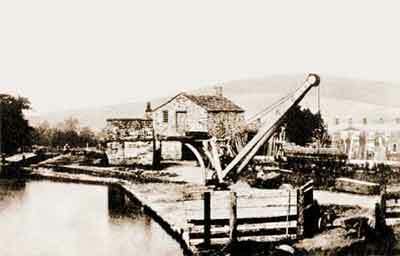 The first locks to be completed in the Marple flight were locks 13, 14, 15 and 16 and it is possible that they opened on the 13 October 1804. It is said that Samuel Oldknow's boat, Perseverance, was the first to lock down. 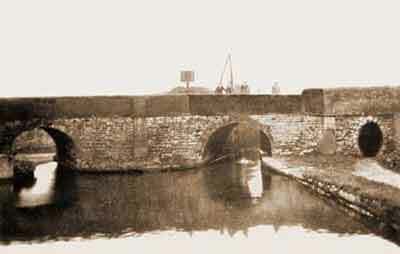 Oldknow offered the workmen posset (a spiced drink made of hot sweetened milk curdled with ale or wine) to complete the locks on time and consequently the bridge became known as Posset Bridge. The Lower Private Branch to Marple lime kilns with Strines Road on the left, early 20th century. It entered the lime shed spanning the head of the branch, where two boats at a time could be be loaded undercover. Boats were loaded undercover because lime had to be kept dry until it was required for use. This branch joined the main line of the canal at Posset Bridge behind the viewpoint. The kilns were supplied with limestone and coal brought along two short arms of the Upper Private Branch to Marple lime kilns located near Top Lock.